GIFTING FOR DUMMIES : What a Basket Case! can set you up with a great gift for any occasion. # gift becomes especially tricky. As a Realtor-turned-entrepreneur, Kathy Ruoff knows this challenge well. In her former profession, she regularly gave housewarming gifts and thank-yous to other business acquaintances. Eventually, she figured that a lot of people could benefit from her knack for gift-giving. Last January, Ruoff, with her partner Debbie Galicia, started a home business based on the concept that many people especially professionals need a resource for quality, ready-made gifts. For the gifting-impaired, the time-constricted, and people who just don't like to shop, Ruoff and Galicia created What a Basket Case! a fresh take on the old wine-and-crackers gift basket. The "baskets" are, in many cases, not baskets at all. Many of the gift ensembles come packaged within an item that's actually part of the gift. A martini set, for example, comes on a tray, or a gardener's gift comes inside a watering can. On the What a Basket Case! web site, www.whatabasketcase.net, you can browse by theme, such as "pet," "home," or "food," or look at gifts for men, women, babies, or "corporate." For men, there are barbecue, sports, and beer sets, with mugs, oven mitts, charcoal, and all the necessities for a manly afternoon. 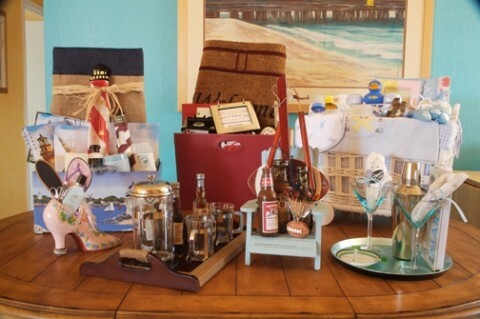 Women's gifts include spa and manicure ensembles, coffee, and margarita party sets. All told, there are 18 categories to pick from. Many clients choose to modify the baskets a little to give them a personal touch. Once you've chosen a gift, you can change the colors or mix and match the items so they fit the recipient just right. Corporate gift-givers often add their logo or cards to the baskets. What a Basket Case! also offers a year-round gifting service on its web site, so customers can register the gifts that they'll need throughout the entire year. The clients simply pick out a theme, a price range (most are between $30 and $100), and the date for it to be sent. What a Basket Case! will make the gift and send a picture of the gift before it's sent. For more information about What a Basket Case!, call 528-8605.